Just a quick post here on what I noticed while watching the first round yesterday, that bled into today thanks to the weather at Merion. 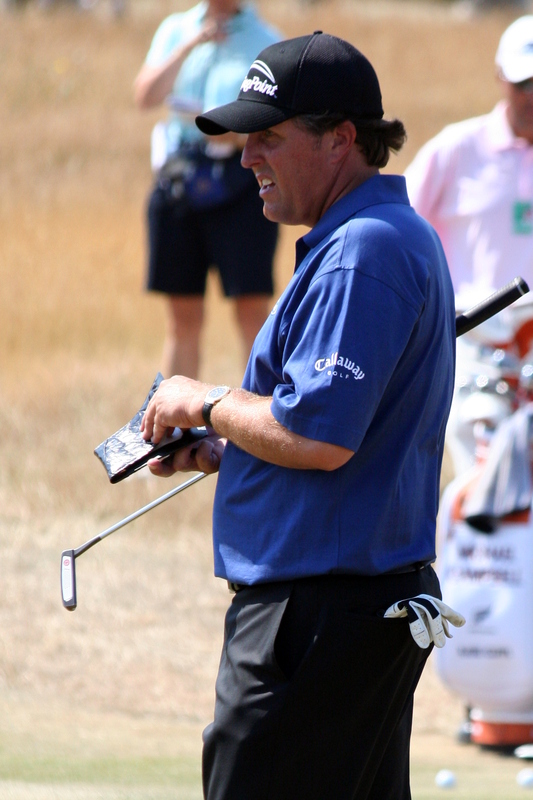 Phil Mickelson currently leads at 3-under par, with several players still on the course. The second round gets underway later this morning. Much was made of Mickelson’s decision to head home to San Diego this week for his daughter’s eighth grade graduation, as his flight back to Pennsylvania was going to get him in about 90 minutes before his scheduled first round tee time. If it isn’t a big name like Mickelson, especially with his U.S. Open track record, nobody even mentions this, but I can guarantee you that the majority of players on the PGA Tour would have done the same thing. The golf media of course took this opportunity to suggest that he wasn’t in the right frame of mind to try to win the event, which is obviously a bunch of nonsense and his 3-under par round showed that he was ready to go. On another note, he decided to take the driver out of the bag for round one, adding a 64 degree wedge. With how short the course is, he really doesn’t need the driver anyway, and I’d imagine that he’s going to follow the same plan for the rest of the week. I touched on this briefly in my A-Z Guide for Fanatico, but the thought of a player who uses an anchored putter winning the U.S. Open after the USGA and R&A officially decided to ban the stroke is hilarious to me. I’ve made my thoughts clear on the ruling already, and seeing five players near the top of the leaderboard (Scott, Els, Simpson, Pettersson and Clark) who all use an anchored putter is probably giving the USGA a massive ulcer. The day one scorecard for Garcia is below. Note that he started on the 11th hole. Now, he actually bounced back from the terrible start and got it to 3-over par, which is only six back of the leader. What struck me most about yesterday though wasn’t Garcia, or the tame reaction that he received from the crowd. It was the almost Christmas morning like glee that many of the golf scribes that I follow on Twitter had when they knew that he was struggling. I get that people might not like the guy, and I don’t know him personally, but the amount of established names who were seemingly rooting for him to fail yesterday was pretty astounding. This won’t get much play outside of my country, but Mike Weir was at the top of the leaderboard for most of the TV coverage yesterday, but ended up at 2-over par after bogeys on 6, 7, 8 and 9. Still though, he’s only five shots back of Mickelson. The power grouping of Tiger Woods, Rory McIlroy and Adam Scott didn’t fare too well in their opening rounds, with Scott leading the way at 2-over par, and the two Nike men one shot back at +3. As of this writing, five players have posted rounds of at least 80 to start their tournaments, with several others still on the course and trending in that direction. Lastly, both Steve Stricker and Adam Scott had to deal with rules officials at some point yesterday due to people calling in alleged rules violations from their couches. This really needs to stop, especially considering that they were both cleared of any wrongdoing, as the players are nine times out of ten.